In foreign policy vocabulary, the word “famine” pretty much functions like an expletive. Two months ago, the UN brandished “the F-word” when it declared two parts of southern Somalia official famine zones. Soon, four more regions were bestowed with the dreaded title. This curse word of sorts, though, can’t be tossed around lightly. Before using it, the UN requires serious number-crunching to show that at least 20 percent of households in an area face extreme food shortages, that acute malnutrition exceeds 30 percent, and that the death rate is more than two people per 10,000, daily. Given its weight, a declaration of “famine” is a serious call for global awareness and aid. And yet, while reports of other natural disasters have jam-packed American news-pages, “famine”— this rare word, for what is supposedly a rare natural calamity—has barely flickered across the daily newscycle. All this is why Thomas Keneally’s latest book—Three Famines—couldn’t have come out at a more appropriate time. In it, Keneally, the Booker Prize-winning author of the novel Schindler’s List, has set out to prove that famines are borne of man-made disasters, not natural ones. Sure, natural flukes are the starting point, he writes, but it’s politics that feed famine’s terrifying momentum. If you follow the situation in Somalia—where tallies of the starving are going up, not down, and where Western aid stands blocked by militant group al-Shabaab—you’ll get the sense that Keneally’s hypothesis is legitimate even before he’s launched into the evidence. But launch he does—and his evidence is nuanced and comprehensive. 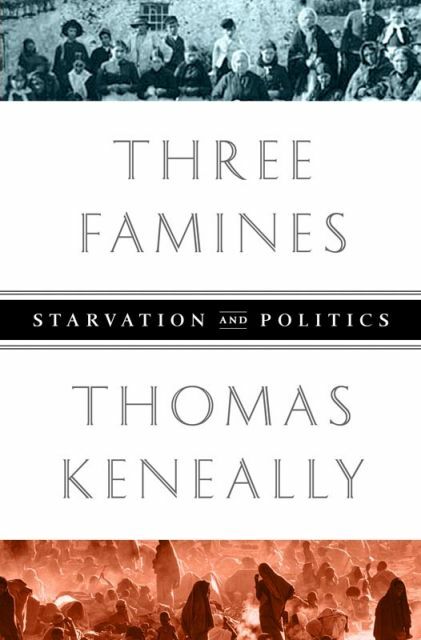 Keneally spends the bulk of the book studying the parallels between three great famines—those of 19th century Ireland, 1940’s Bengal, and 1970s/ ’80s Ethiopia. “There is a remarkable continuity of impulses and reactions,” Keneally writes, for all parties in each famine—the government, the aid-givers and blockers, the deniers, the whistleblowers—and most obviously, the victims. Courtesy of PublicAffairs, member of Perseus Books GroupKeneally starts with the biology—the stomach-churning, nitty-gritty of what happens to the body during starvation: Teeth decay, organs deteriorate, and the hungry brain rots, taking identity and sanity with it. In one case Keneally cites, an emaciated man sits in front of a bowl of rice and curry, but still cries out for sustenance—to his starvation-trained mind, food has become invisible. Later, Keneally spends an entire chapter on common famine diseases like dysentery and diarrhea. Another chapter explores coping mechanisms, and the ones you’d wish were the exception are the rule: theft, selling children into slavery, prostitution, even cannibalism. And then there are the villains. In Ireland, it was Charles Edward Trevelyan, an evangelical Christian who called the potato blight “an affliction of God’s providence” that would just have to remedy itself. Bengal’s culprit was the Marquess of Linlithgow, head of India’s British Administration. For him, famine presented an opportunity to weaken the already-vulnerable, to literally starve India’s budding decolonization movement out of existence. He confiscated thousands of Bengali boats—crippling trade and fishing—sent rice from Bengal to other British colonies, and requested relief fed only to the army. In Ethiopia, there was Col. Mengistu Haile Mariam. Fueled by his dislike of the West, Mengistu first blocked foreign aid, and when he could no longer do that, he simply funneled it towards his own needs. He also openly admired Stalin—”for his surgical ruthlessness.” Interestingly, Somalia’s al-Shabaab takes a chapter out of each villain’s book: they’re motivated by religion (like Trevelyan), impede Western aid (like Mengistu) or misdirect that aid for selfish purposes (like Linlitghow).